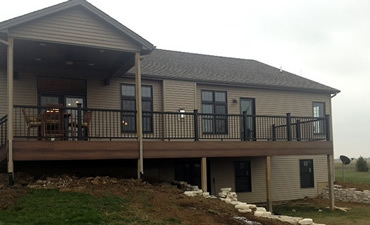 Ruestman Construction specializes in the construction of decks. Decks can be built using a variety of materials including composites, treated lumber and cedar. Often existing decks are not framed properly. Proper design as well as construction is crucial in making sure that you can enjoy your new deck for years to come. All decks built by Ruestman Construction meet and exceed any local requirements. They will also meet the owner's needs as far as function and beauty. There are numerous material selections to make such as flooring, composite or wood? Composites have gained popularity within recent years. Backed by strong warranties composites make a great choice by saving you money down the road. Railing options such as wood, vinyl, metal and composite materials are also available. Picking the right combination of flooring and railing is important in your design.